We all have great plans for our future. However, plans do not become reality if we don’t do anything. We have to do things to achieve these plans. Therefore, “To-do lists” should be the answer to achieving these plans, easy as that. Amazing. Unfortunately, it isn’t as easy at that. To-do lists fail quite often. “Make an air-quality analyzer with the Arduino” has been on my To-do list for months. I still haven’t achieved that. I would really like to know the air quality in my house and I have all the sensors to make an air-quality analyzer. However, there is something about this “To-do’’ that made me not do it. How is that possible? Data from the “Idonethis” app showed that 41% of the tasks on To-do list will never be completed. That seems like a lot to me. According to this survey the main problems for the incompletion of to-do’s were making too many to-do’s, making wrong to-do’s, and giving ourselves too much time for to-do’s. I think that these problems could all be solved with the knowledge of this man; “BJ Fogg”. BJ Fogg is a professor at Stanford University who came up with the “Fogg behavior model”. We all have many long-term goals that we want to achieve. However, Fogg states that we are really bad at achieving these long-term goals. I totally agree with that. Achieving long-term goals is difficult as it costs a lot of effort and motivation. When trying to achieve them, we often we don’t know where to start. Therefore, we need to split our long-term goals into short-term goals in order to make them achievable. Smaller goals need less motivation and are easier to do. Therefore, smaller goals are easier to achieve and if you achieve them you’ll have the feeling of success. Feeling successful more often with tiny goals keeps you motivated and confident, making you eager to achieve more goals. This is scientifically proven (Bandura & Schunk, 1981; Schunk, 1990). If I unpack the sensors from my air-quality analyzer and put them on my desk, I would probably be motivated to do the next step. According to Fogg, achieving goals depends on three factors; the ability to achieve the goal, the motivation for the goal, and the trigger to do the task. If you make your goals easier to do, you need less motivation for doing them. However, you always need a trigger to start working on your goal. Therefore, goals have te highest chance on success if they are in the right bottom of the next graph, just above the action line. Now it’s time to evaluate if I am on track with my to do’s. I want to know how much to-do’s I achieve, and how much I fail. Secondly, I want to know why I succeed or fail. 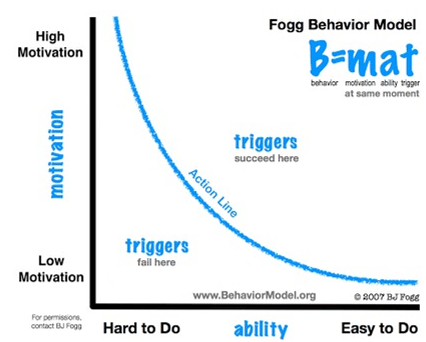 The Fogg behavior model would be great to evaluate my to-do’s and discover the sources of my success and failure. I made 3 goals every day that I wanted to achieve that day. I wrote these goals down on a paper, similar to next table. In the morning I made my goals and in the evening I reflected on these daily goals using the Fogg behavior model. I wrote down if I did the task, if I had a trigger to do the task, how high my motivation was for this task (1-10 scale), and how high my ability was to perform this task (1-10 scale). I did this for 22 days. Over these days I had 63 to-do’s in total to reflect on. How is my success rate? Out of the 63 to-do’s I made, I failed 21 goals. This means that I exactly failed one third of my daily goals. Actually, this is less than the average 41%, however a failure rate of 33% still seems a lot. How is that possible? Unsurprisingly, motivation and ability were significantly higher on my achieved goals compared to the failed goals (see next figure). I finished my to-do’s more often when I wanted to do them and when I was able to do them. My ability was below average for 6 of the achieved goals, and my motivation was below average for 8 of the achieved goals. This shows that I can achieve goals even when my ability is low or my motivation is low. However, I also fail to achieve many goals. I found that out of the 21 goals I failed, 11 lacked a trigger; I had no reminder for myself for doing this task. Also, at 11 of the 21 failed goals my motivation was to low (≤5), I didn’t want to do them. Lastly, at 8 of the 21 failed goals my ability was below average (≤5), I just was not able to do them. Out of the failed goals, 10 had a trigger and 11 did not (see figure). When I did not have a trigger my ability was higher than when I had a trigger. I only achieved two-third of my daily goals. Failing that many daily goals has consequences for the success of my daily life. Although I am glad with achieving 67% of my goals, it is important for my development to reflect on the things that went wrong; the failed goals. Out of the goals that failed, more than half of them had no trigger. This means that I just forgot to do these tasks because I had no reminder. Nonetheless, my motivation for these goals was also pretty low. It seems like I did not add a good trigger on purpose or I did not listen to the trigger. This means that for my own good, I should add stronger triggers to achieve my daily goals. What is also important for me is the fact that my ability was not the main reason for failing goals. Before this experiment, I would probably have reflected on my failed goals with: “I can’t do this, I am not good enough”. Now I know that that is not the reason, I just made my to-do’s wrong or I had no motivation for doing them. It is important for me to improve these aspects. How can we do that? I reviewed my triggers and even though I knew the importance of triggers, I did not add them to several goals. I just didn’t know how to add good triggers to several of my goals. As I went searching on the internet, I found several ways to set good triggers to remind you of your goals. The first and easiest way is adding a timeframe to your personal goals, for example between 12 and 13 o’ clock I will work on this project, or at 8:30 I will call my mom. I already used this trigger, however it did not always work. The problem is that you have to watch the clock quite often to remind yourself. A better and similar method is setting an alarm at 8:30 exactly to remind you of your task. That works better. However, the downside of this method is that you will get used to the alarm and after a while you will lose the strong response to this trigger. Therefore, it could be helpful to change your alarm-tune once in a while. The third option is a method in which you associate your task with another event. For example, after I brush my teeth, I will do five push-ups, or, after my kids go to school, I will clean the dishwasher immediately. Because you will do this task every time after another task you’ll get used to doing it. Therefore, this method works great for establishing habits. The final method, and in my opinion the best method, is to set triggers you can’t deny. In this method you use objects to help you remind yourself of a task. For example, if you plan to go running in the morning, you already put your running gear next to your bed. When you tend to forget a goal, another option is to do something weird to remind yourself. You might put a piece of fruit on a weird (but visible) spot to remind you of your tasks. You’ll start thinking; “why did I put that piece of fruit there?” and you’ll know why. It is crucial which kind of goals you make. You should have some sort of motivation for achieving your goals. Your goals should be meaningful to or valuable for you. If they are not, you simply won’t achieve those goals. By only doing things which motivate you, you’ll find your path to the things that you desire. However, keep in mind that we are also very bad in balancing our short-term desires with our long-term desires. We are very motivated to fulfill our short-term desires. I always want to relax and enjoy the sun, but sometimes I don’t want to relax because my long-term desires are more important for me although not as fun. You should have the ability to reach a goal. Therefore goals should not be too difficult for you. Making goals tiny makes them easier to achieve. In that way you have more opportunities for success (Ambrose et al., 2010). Such success plays a crucial role in shaping your expectations and self-efficacy for future performances by increasing your sense of competence (Bandura, 1986). Increasing your sense of competence will increase your motivation for achieving more difficult goals. An incentive is a strong motivating force for achieving goals. However, there are two types of incentives; positive incentives and negative incentives. Positive incentives are incentives that motivate individuals through a gain (for example, a bonus) and negative incentives are incentives that require individuals to perform in order to avoid a loss. When reaching our goals we often give ourselves positive incentives like a funny dance, a compliment or a delicious treat to celebrate your victory. However, recent research showed that negative incentives are more motivating for people to achieve certain tasks. So we are more motivated when things are at stake. With this in mind, a professor at Yale designed “the StickK method”. With StickK you make a binding agreement with yourself which you sign in order to ensure that you accomplish your goals. This method utilizes the psychological power of loss aversion and accountability to drive behavioral improvement. Very often an anti-charity is chosen as a warranty. For example, if you don’t like KKK, you sign a contract which states: “If I don’t lose 10 kilo within three months, I will donate 100 bucks to the KKK”. This will get you very motivated to achieve your goal. It works even better if you give someone else your money to donate it for you. I learned from this experiment that my reason of failure is often not my ability but my motivation and my way of making goals. 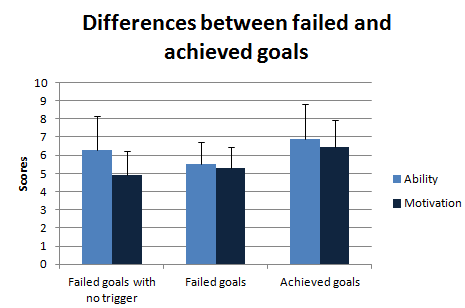 I made my goals wrongly by not applying good triggers to every goal. I might need to go crazy more often by making weird triggers to remind me of my goals. Maybe adding some negative incentives would help? Who would like to donate some of my money to the KKK? found you via QS on twitter.